In a lot of ways, Jonathan Hickman tends to approach writing comics like a science experiment-- everything is meticulously planned years in advance, engineered to produce a specific result when it's all said and done. 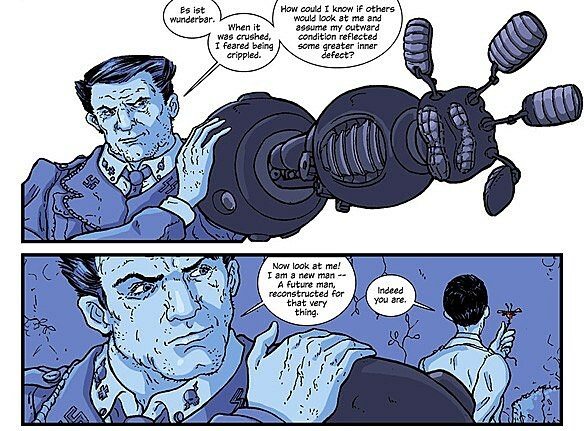 It's fitting, then, that for The Manhattan Projects, his creator-owned book with Nick Pitarra from Image that stars a team of historic scientific heavyweights like Einstein, Oppenheimer, Von Braun and Feynman engaging in bizarre feats of super-science, Hickman's formula is a little more mad. No plans, no long-term view, just making the best comics they can. With six issues of bad science under his belt and the first arc collected in paperback, Hickman spoke to ComicsAlliance about his process, his inspiration, and why he wants his creator-owned work to be different from the books he's doing at Marvel. ComicsAlliance: It's been a while since you've done a book that, for me at least, was as funny as Manhattan Projects. For a book that has cannibalism, a Nazi with a robot arm and interdimensional murder, it's a very funny book. Has there been any reaction from people who weren't expecting that, who maybe didn't read Transhuman? Jonathan Hickman: Is that the last funny thing that you think I did? Transhuman? CA: Well, there's been some funny stuff in Fantastic Four, but for Marvel Comics, that's a very serious book. JH: Sure, sure. 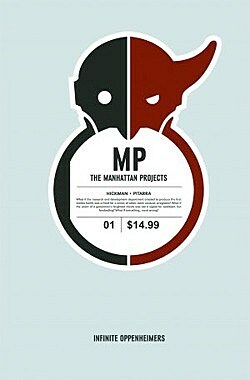 Reaction to Manhattan Projects has been really good. Certainly, I can't say anything but that to it, but that's also that weird thing where at Marvel, people buy your books even if they kind of hate you, because they want to buy the book. They want to read Fantastic Four or something like that, and so you have people buying your book that may not be wholly supportive of you. CA: I like that the book that you think reflects you as a person is the one that has a bunch of evil geniuses in it. JH: [Laughs] Right. Who knew that cannibalism could be this hilarious? CA: It's an interesting book. You talk about readers getting to know it within those first few issues, but really, each issue adds so much and changes so much in the formula. It's a fast-moving book in that respect. JH: Yeah, the structure is pretty funky. There's a couple of things at work there that make it feel that way. One is that this is the first book I've ever written where I'm intentionally not thinking ahead about what's going to happen 20 issues down the line. This is literally, I sit down to write the book each month and I'm only thinking about that issue or how it ties into the next issue, or what could lead to the next one. I'm intentionally not planning ahead, so it's very organic, which is why it has the kind of velocity that it does. The other thing is that I tried to make the first arc one-and-done. The rule that I had in the back of my head was that each five-issue arc, one would be one-and-done and the next would be character driven, and the next would be plot-related, so I could switch back and forth with the understanding that I could break the rules at any point in time. So that's what happened in the first five issues: You get to meet all the characters and the world is changing around them, and then in the second arc, we push the narrative a little more to say "here are all these amazing evil geniuses that are remaking the world in their own image. Who are the people who are opposed to that, and would that ever be able to be a successful endeavor in anywhere that wasn't a vacuum." And the answer, of course, is no. That's what we get into with all the Russian stuff, and the people who rule the world in secret, and generally all the junk that's coming down the pipe. CA: You're usually a pretty meticulous planner. I've talked to you when you've had story arcs planned out years in advance. JH: Well, you know, I just got finished pitching two and a half years at the last Marvel retreat for Avengers, a double-shipping book. That is how I normally work. But a lot of that is because I'm still relatively new at this, so I make guidelines to work from or limitations to how I work just to make sure that I can be creative and not reckless. But this is fun. This is just a lot of f***in' fun. CA: Is that something you wanted to do? 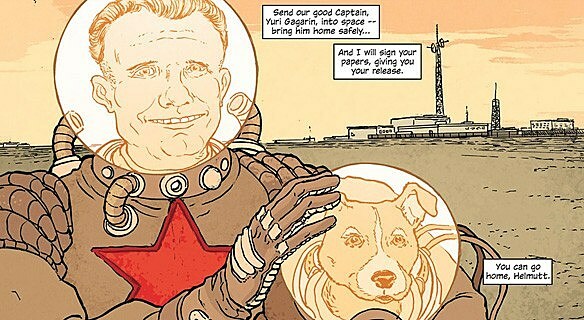 Was the goal with Manhattan Projects just to do a book that didn't have so much planning, or was that something that came after the original idea? JH: In regards to experimenting and trying new things with every project I have, the goal here was to write purely organically, in a purely organic fashion for the first time ever. That was the point. I didn't know that I would enjoy it so much or that it would have the results, and all that kind of stuff, but I planned on doing the book for quite some time. The book will continue for quite some time, so I was comfortable with it being open-ended for now. I always think you should be working towards a conclusion if you're telling a finite story, but for now, Nick and I aren't doing that. Nick didn't want to do that, either. Nick wanted to work on something we could spend five years on. He's loving it, and totally committed to it. It's just comfortable. CA: Is there any give and take in your working relationship with him? Did you say "hey, is there anything you want to draw?" and have him respond with "Oh, Samurai Robots!" JH: The first issue was pretty heavily scripted, but after that, Nick and I have been extremely loose. We've worked Marvel Style a couple issues. We've done pages where we just talk on the phone for a little while and talk about what should be on the page. It's easily the most collaborative book I've ever done. Nick is very opinionated, like I am, very creative, and has very strong feelings about how the page should look and how all this stuff should be reflected in his art. He's pretty great to work with. CA: One of the things that I've been curious about since the book started is that it's loosely based on historical figures, but they're taken to such a weird extreme. You have evil twins as a recurring theme in the book. Wernher Von Braun, to my knowledge, did not have a robot arm. How much research went into it between you wanting to do what you called "The Thunderbolts of Science" and what you ended up with? JH: I did a lot of research, but the research was to find the interesting little cracks. Like, Wernher Von Braun having a robot arm came from him having a really bad arm injury, and there are a bunch of photographs of him in this ridiculous cast, with his arm propped up. That kind of stuff. Harry Daghlian died from radiation. I specifically looked for the scientist that was the first to die from exposure to radiation. Enrico Fermi and the Fermi Paradox, him being a disguised alien was just kind of funny. All of it came from little pieces of research and taking it and bending it to an extreme. I know for a fact that there were people who were very, very upset with me about Feynman. But, you know. If you can't sh** on dead people and get away with it, who can you sh** on? CA: Did you have archetypes in your head? Did the character roles come first and you chose the scientists to fit them, or was it more that you felt like you needed Einsten, Von Braun, Oppenheimer, and then figured out where to go from there? JH: I knew who the big guns were that I wanted to use, and from there, I looked for extra people to fill out the cast. Like the Russians that we met, those are pretty fringe for many Americans and British people that are reading the book. For the most part, you get Einstein, you use Einstein. I like the fact that of all the guys in the room, Einstein's the one who isn't as smart as everyone else because he's the Einstein from the alternate universe that was too dumb to make the Einstein-Rosen bridge work, you know? Einstein is the dumbest guy on the team. He's not dumb, but he's the dumbest super-scientist on the team. I find it funny. CA: You're taking it back from people using "Einstein" sarcastically. JH: I'm taking it back for the idiots, right? CA: That was the big surprise for me in the first arc. 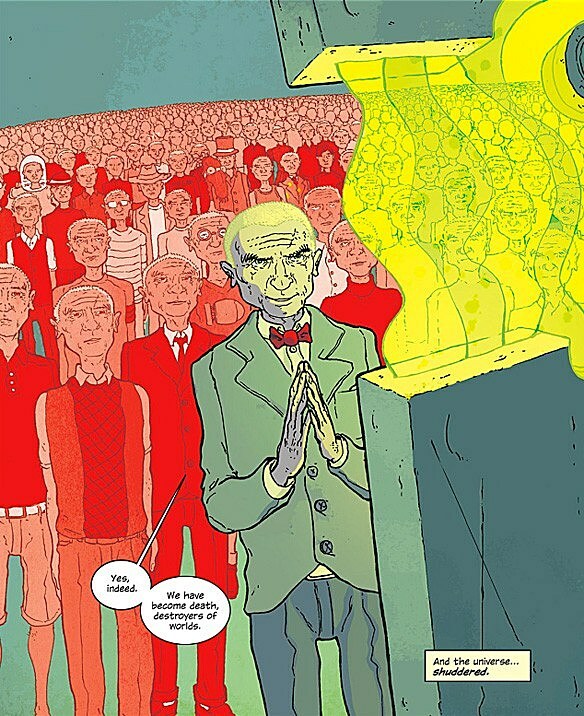 There are so many surprises; you open with that great Oppenheimer issue that has this weird twist at the end that sets up a lot of the themes that you explore in the book, but the Einstein thing took me by surprise. Just when I thought I had a handle on what you were doing with those characters, you took him in a completely different direction and made him the worst. He's the most evil! JH: There's a lot of meat on the bone there. I don't know when we'll get to it, but Good Einstein trapped on a world with horrible functioning science is going to be a hilarious issues. CA: In my head, I've been predicting it as that one Wolverine panel where he's down in the sewer. "Now it's my turn." CA: If Nick is taking commissions, I kinda want that panel with Einstein. JH: Well, Nick can be bought. That wouldn't be a problem. CA: Was there any problem figuring out the rules that this world has? The thing about those characters is that as weird as the stuff they're doing in your book is, the things they actually did were considered impossible. Splitting the atom, putting rockets on the moon. JH: They're real-life super-heroes. It's like when you read a comic, you're not surprised when you see a panel where Superman is holding up a planet, right? It's an absurd idea, but you would never think that was ridiculous. In the same instance, if I tell you that in secret, Einstein and Von Braun built a space station in secret, you'd be like "okay." You know? You just kind of buy it, so yeah, you can get away with a whole lot just because those guys actually were that amazing. When you twist it and say "what if they weren't just geniuses, what if they were super evil geniuses with agendas and plans and machinations," there's a lot of rope there. CA: When I talked to you before the book came out, you made a joke about how the estate of Wernher Von Braun was going to come after you, and a second ago, you mentioned angry Feynman fans. Have you had any angry letters from scientists? JH: No, that's the thing about most scientists. They're curious and hilarious. Most research guys have a pretty good sense of humor. I did get asked to please keep the Manhattan Project Foundation apprised of any work that I was doing and give them a heads up, as they were the guardians of the legacy of the project. Then the first issue came out, and I didn't hear sh** back. CA: You talked about going at it without a plan, but I can't imagine you're a guy who can write those characters without thinking a little about how they're going to interact in the future. Is there anything you can tell us about what's coming up? JH: I think that clearly, Oppenheimer has plans, and I think that's going to come to a pretty big head at some point in time. In the very near future, over the next five issues, through issue 10, a lot of that is about how these guys can only keep this stuff secret for so long, especially with the kind of leaps and massive increases in risks and exposures that they have as their plans get larger. When the president, and the people that own the president and the people that run the world find out what Leslie Groves and Oppenheimer and the Russian equivalent that was being built at the same time as the American version are up to, there's going to be a pretty big response. That is going to take us over the next five issues and spill out after that. The cast will grow a little more, but we're going to keep it to ten or so main characters. Some will last for a long time, I believe, some are not long for this Earth. There are no rules. In the way that I always describe Marvel comics as being perpetual second act comics, where part of our job is to protect IP, in this instance there's none of that going on. The story can go wherever the story needs to go. If a character has to go, they have to go. If they need to radically change for the betterment of the story, then absolutely, they'll change if they need to. If they need to do a thing that makes it so that they can no longer be buddies with one of the other evil scientists, so be it. That's going to happen. I'm excited to tell a longer story like that. It'll be fun. CA: It seems like this entire enterprise is, in a way, a reaction to your other work. It's so different in terms of process and what you're allowed to do. You and I have talked about the balance that you want to hit between creator-owned books and major-publisher superhero stuff, so is that one of the motivating factors? JH: I'm always trying sh**, you know that. Each project is an excuse to try out new ideas and new techniques and all of that kind of stuff. I'm always trying things. But certainly, there's a component of working at Marvel where you're not allowed to use some of the stuff that may naturally be occurring if you were just writing it, sitting alone with no supervision. Adult behavior as opposed to supervised adult behavior, you know? One dude on an island, or a dude in a city. There are different rules. I feel like it's been a while since I've done any creator-owned stuff. It's been two years between my previous Image stuff and this new crop of Image stuff that I'm doing, and I felt like there are certain tools in my arsenal that were dull because I wasn't using them. It was concerning me a lot, because you want to keep your instruments sharp. It's like muscle atrophy. You need to exercise certain things, you can't just only use a small set of muscles. I feel like this is a lot of that. I think Marvel is awesome, and very beneficial in a lot of ways, but doing it in conjunction with Image stuff is even better. I feel very well-rounded in regards to my craft whenever I'm doing both things as opposed to just doing one. CA: I also really like that when you think of the real-life equivalent of superheroes, you go to Oppenheimer and Einstein. Those are the guys that are closest to superheroes for you. JH: Well, nobody wants to read a comic book about f***in' soccer, Chris. This isn't Japan. You can't sell that book here.